Good evening everyone! Please excuse the late posting today, I've been out in the chilly fall air with a horse (yes a real live one! ), model (who is incredibly gorgeous!) and photographer (crazy talented) doing a shoot for some new masks so am just getting to blogging now! Over the next several weeks, I'm going to be featuring some of my favourite Mama bloggers who I collaborate with and bounce ideas off of regularly. They're simply fantastic, and I'm so excited to introduce you to the very first one, Tottums from The Froggy and The Mouse! Hi! I'm Tottums, and I blog over at The Froggy and the Mouse! 'The Froggy and the Mouse?' you ask ... what's with that name? My blog is aptly named after my two boys' nicknames ... the Mouse is my oldest (3 years) and squeaked so much when he was born that we immediately thought of a tiny little mouse. The Froggy is my youngest (6 months) and kicked SO hard and SO much when I was pregnant with him that he earned his nickname before he was even born ... and he still continues to be a mover and a shaker! I blog about my kids, and being a somewhat (okay REALLY) imperfect mom. I take a lot of photos, I do a lot of organizing, I write a little (lol). I'm looking forward to my blog growing, and hopefully gaining some sponsors to help get me to a blogging conference or two this coming year! Stop on by and check me out! 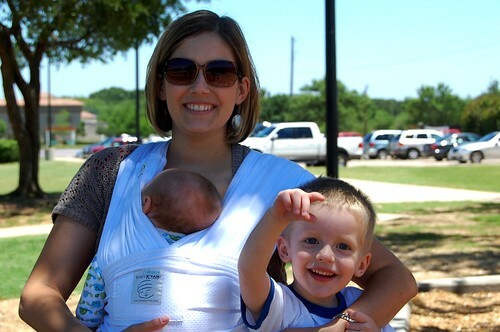 You can follow this rockin' Mama on Twitter, and on her blog of course!